We’ve reviewed quite a few mid-range Xperia smartphones and most of them did great on our battery life test, so we had some high hopes for the Xperia C3 and its 2,500 mAh battery unit. Our review is live at our homepage, so it’s time we put our detailed battery life breakdown out there. Sony Xperia C3 is available in two different flavors – in single-SIM LTE model and another one with two SIM cards and 3G connectivity. Since we only have the dual-SIM model, we did our tests both with one and two SIM cards inside. Much to our our surprise, all test came out the same, regardless of the number of active SIM cards inside. Our first test gauges the 3G talk time endurance. 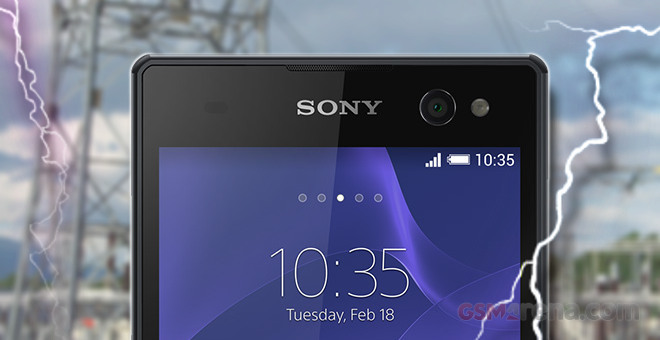 As it turned out, the Sony Xperia C3 Dual doesn’t offer the advertized dual-call feature, so it’s only natural that regardless whether you are using one or two SIM cards, the final battery life is the same. 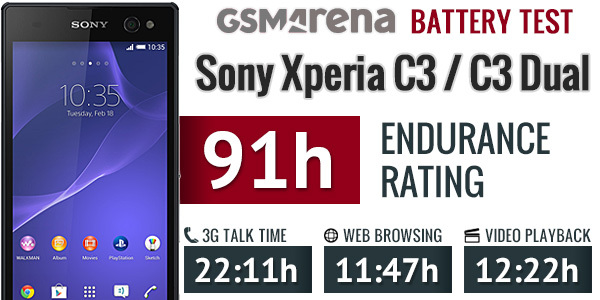 Sony Xperia C3 did excellent here, scoring a little over 22 hours. We measure the web browsing endurance with a dedicated script that emulates normal browser usage. The Sony Xperia C3 once again did great, packing enough juice to come just shy of 12 hours. Next up, we left the Xperia C3 on a looped video playback and it once again the smartphone posted a great score – over 12 hours before its battery dropped down to 10%. Just like most of the Xperia phones we’ve tested through the past year, the Xperia C3, whether using one or two SIM cards, posted a solid stand-by endurance. All those great scores lead to the amazing endurance of 91 hours, which means you can count on it lasting almost 4 days if you do an hour each of talking, web browsing and playing videos per day. Make note that our proprietary score also includes a standby battery draw test, which is not featured in our test scorecard but is calculated in the total endurance rating. Our battery testing procedure is described in detail in case you want to learn more about it.